If you struggle to push on through your workout regime after a hard day, you won’t be alone. Many people feel they need an extra kick to get everything done nowadays, and exercise is no exception. This is one of the reasons sports supplements are so popular, after all. Alani Nu is a brand new ‘pre-workout’ supplement which has been created by the Instagram fitness star, Katy Hearn. Marketed at women, it claims to give you that boost required to help you smash your gym targets and feel good while you’re at it. But like all supplements, they may not always be what they seem. In our eyes, Alani Nu is no exception. In this review, I will take a closer look at the ingredients and doses contained within Alani Nu, to see if it can really stand up to its claims. Alani Nu Pre Workout is a powdered pre-workout booster drink, which claims to boost your energy levels and increase your endurance during exercise. It has been created by Instagram fitness influencer Katy Hearn and is part of a wider range of Alani Nu sports supplements. Relatively new to the market, each product in the range features very feminine, pastel colors designed to appeal to women. Alani Nu Pre Workout comes in a huge variety of sweet fruity flavors, named after tropical locations or childhood candies. Customers are promised that the formulas contain no fillers or ineffective ingredients, but the only way to know for certain is to check it out ourselves. Of course, the backbone of any supplement is the ingredients. It’s all well and good having fancy packaging and exciting claims; but if the formula doesn’t stand up, it’s a waste of time and money. With that in mind, here’s my breakdown of the ingredients featured in Alani Nu Pre Workout. You may never have heard of it before, but L-citrulline is a form of amino acid which is non-essential. This means that you don’t have to ingest it from your “diet”, or supplements, as it is naturally generated in the required amounts within your body. However, supplementing with additional L-citrulline has a wealth of benefits when it comes to boosting the results of your workout regime. It is very effective at increasing energy levels, as well as your endurance when under stress. For example, a study found that taking L-citrulline before lifting weights enabled the participants to double the number of repetitions they could complete before fatigue set in. They also recovered much faster, with reduced muscle soreness after their workout. Not only that, but L-citrulline can elevate your aerobic endurance too, helping you to push further on the treadmill when you would ordinarily give up. Regular consumption of this ingredient can also keep your heart and vascular system healthy. The only issue I have with this ingredient is that it is highly ‘hygroscopic’ (sensitive to moisture), so there’s a chance you will get some powder clumping with this product. In order to avoid this, you must be careful to store it in a dry place, and not to get any moisture inside the tub. This compound works to reduce acidity within the muscles, thus helping to improve endurance and extend the amount of time they can withstand stress before reaching exhaustion and failure. Therefore, beta-alanine is a worthy inclusion in this supplement. When combined with L-citrulline, this ingredient can certainly boost your performance in the gym. Yet another amino acid, L-tyrosine is beneficial, less to the body, but to the mind. It is one of the foundation compounds of important neurotransmitters—chemicals which play an important role in our moods and ability to focus. L-tyrosine can thus improve your attention and determination, even when you’ve had a long day and are feeling the strain on the squat rack. Caffeine is a common ingredient in sports pre-workout supplements, and for good reason. Not only does caffeine boost your energy levels and endurance, but it can also increase your power output and make your reps feel easier. L-theanine is another amino acid which is found in green tea. It can be useful for boosting focus and calm, as well as helping with energy levels. It accomplishes this by increasing the concentration of glycogen stored within the liver. This glycogen is used as a form of energy when you hit the gym, helping you to push through when you would normally feel tired. Furthermore, L-theanine elevates the production of nitric oxide, which is known to improve circulation and therefore the delivery of oxygen to your muscles. Overall, the Alani Nu Pre Workout seems to be a decent product. All of the ingredients featured are well known for their benefits, having clinical evidence to back them up. The only issue I have is that this formula isn’t particularly original. These ingredients are found in most pre-workout supplements seen on the market currently. We would have liked to see newer, revolutionary ingredients, such as caffeine booster eXtra, and the energizer Oxyjun, included. Because these ingredients are so powerful, they are also a little more expensive. Therefore, it isn’t a surprise to see them omitted from a budget product such as this. To start with, mix half scoop in 6–8 ounces of water, and drink 20 to 30 minutes before you start your workout. Once you are used to using this product and are comfortable with its effects, Alani Nu suggests you can increase the dose to one full scoop. Alani Nu is a budget pre-workout formula, targeting the lower end of the market. A tub of Alani Nu on Amazon costs $39.99 for a month supply. GNC online is currently running a special where if you buy one case you get one 60% off. The online price for a month supple case is $27.99. When you consider this will last you a month if you work out every day, it’s very affordable. It is sometimes possible to find an Alani Nu coupon online. As with all supplements, there are some potential side effects to be aware of. Chief among these will be symptoms related to the consumption of caffeine. Most people will feel a bit jittery if they consume large amounts of caffeine, but this becomes more problematic if you have a sensitivity to stimulants. Alani Nu contains 200 mg of caffeine per serving. Therefore, there is the potential that you may get headaches, palpitations, dizziness, insomnia and a feeling of anxiety if you are unused to this kind of dose. Alani Nu advises users that they may experience a tingling sensation after consumption. This is due to the action of beta-alanine and is nothing to worry about. Beta-Alanine: is a non-essential amino acid that is produced naturally in the body. Beta–alanine aids in the production of carnosine. That’s a compound that plays a role in muscle endurance in high-intensity exercise. Many Alani Nu BCAA users and an Alani Nu Balance review said they found it worked well in combination with Alani Nu pre-workout. Alani Nu Amazon reviews are generally positive about the energy boost they felt after taking this supplement. However, there are only a handful of reviews available. I found that lots of Alani Nu reviews were unhappy about the powder clumping, due to the use of L-citrulline. L-citrulline: The organic compound citrulline is an α-amino acid. Its name is derived from citrullus, the Latin word for watermelon. This is unfortunate, but not unusual with pre-workout supplements. As we mentioned previously, this ingredient is sensitive to moisture, so you should take extra care to avoid getting any liquid into the tub and keep it in a dry place. Should you experience any clumping, it isn’t the end of the world. All you need to do is break up the lumps with a fork and use as normal. The effects of the formula will not be compromised. 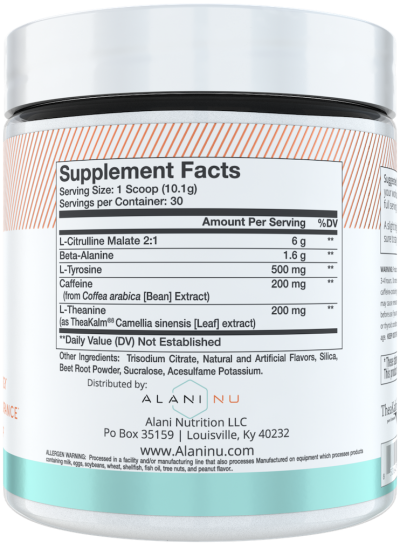 Alani Nu is a promising pre-workout supplement, which includes many well-researched and effective ingredients. You are likely to feel a good energy boost from this product, but it isn’t anything unique in the market. It is a shame that Alani Nu chose to omit newer, and more powerful substances such as Oxyjun. Oxyjun: is a stimulant free proprietary extract of Terminalia arjuna (TA) bark free from arjunolic acid and is standardized to polyphenols and glycosides. The raw bark of the Terminalia arjuna tree has been used traditionally in Ayurveda for centuries because of its cardiotonic properties. Arjunolic: Arjunolic acid is a pentacyclic triterpenoid that is olean-12-en-28-oic acid substituted by hydroxy groups at positions 2, 3 and 23 (the 2alpha,3beta stereoisomer). Isolated from Symplocos lancifolia and Juglans sinensis, it exhibits antioxidant and antimicrobial activities. It has a role as a metabolite, an antibacterial agent, an antifungal agent, and an antioxidant. It is a pentacyclic triterpenoid and a hydroxy monocarboxylic acid. It derives from a hydride of an oleanane. Missing newer, more powerful ingredients. Caffeine content may be too high for some. At $39 for a month’s supply at Alani Nu retailers, this pre-workout powder is unlikely to leave you bankrupt. The ingredients are respectable but not original. You can expect to feel a boost in energy and stamina as a result of taking this supplement. There is evidence to back up the benefits of the ingredients used in the formula, even if the blend is missing a few of our favorite specialty ingredients. In my humble opinion, Alani Nu is an ‘OK’ pre-workout, which could help you with your most tired days.